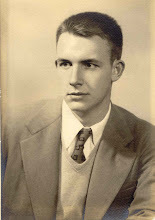 Chuck Hileman, my father, died on November 10, 2012. He was 85. There are a lot of things I could write about my Dad. I could write about his military service in both World War II and Korea. I could write about the three degrees he earned from his beloved University of Virginia. I could write about his long and distinguished career as an educator and counselor to countless young people. I could write about the aspects of his character that made him special –- his compassion, his gentleness, his faith, his humility, his love of family, his sense of fairness. Instead, I want to share one memory of my Dad, because it says a lot about what a down-to-earth man he was, and how he could find joy in the simplest things. It’s perhaps my best memory of him, and like many good memories it didn’t seem like much of a big deal at the time. I was 7 years old. It was late summer; school hadn’t started yet, but the mornings were cool and you knew that fall was just around the corner. One morning, before the sun was even up, Dad came into my room, woke me and said, “Let’s go fishing.” I’m sure I was a little bleary-eyed, but I said “sure,” and off we went to his favorite spot on the river. It was clear but chilly that morning, so Dad made a little fire on the bank so we could warm our hands as we fished. There was mist on the water, and I remember the sun coming up over the mountain on the far side of the river and the light shining through the mist and reflecting off the water. And I remember Dad looking around, smiling, and saying how beautiful it all was. In the 49 years that have passed since that day, I don’t think I ever saw him happier. So that’s where I leave him, and that’s how I’ll remember him. Not made frail by time and illness, but young and strong, on the riverbank next to the fire, with the sun shining, doing one of his favorite things in one of his favorite places. Today is one year from that terrible morning when I got the call from Matt telling me that Dad had suffered an apparent stroke while getting ready to attend church. Little did we know how much our lives -- and especially Mom and Dad's lives -- were about to change. But, despite all the difficulties of the past year, the good news is that Dad is still with us and doing pretty well. In a recent follow-up visit to the stroke team in Charlottesville, Dad impressed everyone with how physically strong and mentally sharp he is. I'm not sure if anyone else is even still checking this blog, but it is somehow comforting to me to keep updating it from time to time, even when (and perhaps especially when) there is no news. In that spirit, my hope is that there will be very little news this year! 9/26/09 -- Happy Birthday, Dad! Dad turns 82 tomorrow, a milestone that, only a few months ago, none of us were entirely sure he would reach. Unfortunately, he will spend his birthday back at Sheltering Arms Rehabilitation Hospital outside of Richmond. Last weekend, Dad had to undergo surgery to repair an abdominal problem resulting from scar tissue left by the emergency surgery he had last spring. Dad came through the surgery well, but it left him weak, so he is back in rehab for a week or two to help him regain his strength. As I sat down to write this, I was surprised to note that it has been five weeks since this blog was last updated. This is mainly a reflection of the fact that Dad's condition has pretty much stabilized, and that there is (blessedly) much less news. The biggest event of the last several weeks was a wholly positive one -- in early June, Dad returned home to Millboro for the summer. This was his first time home since he suffered his stroke in February. My sisters Anne and Terry -- who have much of the summer off -- will be taking turns staying with Mom and Dad in Millboro until late August, when my parents will return to Matt's home in Richmond. It has unfortunately become clear that although Dad's medical condition has improved remarkably since those awful days of February, he is not (and may never be) capable of full independence. Fortunately, he does not need full-time professional care; with some training, by brother and my sisters have become able to provide the assistance he needs, allowing him to stay with family rather than having to go into a health care facility. Dad is happy to be home, and can now concentrate on gaining back some of the strength and weight he lost during his long recovery. I got to see Dad and Mom this past weekend for the first time in several weeks. Dad continues to surprise me with his progress. He is much stronger in his ability to get himself up and off his bed, chair, etc. He is able to get around Matt's house almost totally without cues to remember to stand up straight, bring his left hand up with his right when holding the railing going down the stairs and not bring his walker out too far in front of him when he walks. He is now completing sudoku puzzles like a "fiend" doing everything he can to make the most progress possible in the area of cognition. He told me how to check his blood sugar, blood pressure, and perform all of the other tasks needed to keep him going on a day to day basis. His long term memory continues to be wonderful and his concentration has improved tremendously. On the down side Dad continues to be shaky and unsteady. While he can tell me how to do daily tasks he is too shaky to complete them himself. We are all fearful that Dad will fall because the "steadiness" is just not there. Most importantly we are all coming to the understanding of how much the right and left side of a person's brain works together to define who we are. With the massive damage to the right hemisphere of Dad's brain we are getting to know a father who is so much the same but at the same time so different. At this point Dad and Mom plan to return to Millboro on June 13, 2009. This will give us just enough time to get them settled at home before Mom goes in for hernia surgery on the 15th. Hannah and I plan to spend the summer in Millboro and with everyone's help hope to keep them at home during summer vacation. Mom and Dad are working hard on looking at options for their care on a more permanent basis when summer break is over. Dad wants everyone to know how much he has enjoyed their cards, letters, telephone calls, and prayers during this time. He is working on sending cards to as many people as possible but we haven't been able to get a lot of them completed. We will get through them all slowly but surely. In the meantime please remember how much you all are appreciated. The most significant recent event occurred last Friday, when Dad finished the 30-day outpatient rehab program he had been attending. He made a lot of progress in that program, and really liked the staff. He is now in the process of making the rounds of various doctors for various medical follow-ups. The big question now facing us is "What's next?" At least for the time being, Dad continues to stay with Matt and his family outside Richmond, and will shortly begin attending physical therapy a couple days a week. (Matt has been doing a truly amazing job as Dad's primary home caregiver; we are all indebted to him for his selfless and tireless efforts.) In the meantime, we are researching and gathering information to identify the options for Dad's next steps. Yesterday I had my first chance to visit Dad since he left Sheltering Arms and moved in with Matt so that he could continue his rehab as an outpatient. With me were my wife Patrice, daughter Melinda and son Jonathan. Mom was also there, as were, of course, Matt and Karen. We had just arrived and were chatting with Mom when here comes Dad, walking down the stairs! It was a slow and painstaking process, but he did it on his own, with Matt prompting him on occasion. From the bottom of the stairs, he walked across the living room (using a walker) and seated himself in his favorite chair, which Matt had brought from Millboro. This is incredible progress from where Dad was only a few short weeks ago. Equally impressive is Dad's voice, which does not in any way suggest that he had a severe stroke less than three months ago. As Mom said, "he sounds just like Chuck." Mentally, he is pretty sharp, and his memory remains sound. Physically, everything Dad has been through in the last months has left him weak (although he continues to get stronger) and very thin. Oddly, given that for weeks he could not eat anything, Dad has very little appetite, even though he is now able to eat pretty much whatever he wants. As we sat there in Matt's living room, with Dad in his favorite chair, Mom sitting beside him and a half-dozen family members surrounding him, the scene felt eerily normal. It was easy to imagine that it was just a small family get together on a random day before February 8. Unfortunately, that is not the case, but the mere fact that it could seem like it, even for a little while, shows just how far this tough, resilient man has come. What is... just a quick update on Chuck. I just wanted to update everyone and let them know what is going on with Dad. He is continuing to rehab at the outpatient clinic of Sheltering Arms in the Bonaire section of Richmond and so far seems to be doing pretty well. He is completely done with that awful feeding tube and is totally on solid foods. His appetite could be better but he hasn't lost his taste for peanut butter, ice cream, or that pleasant looking concoction he refers to as Irish oatmeal. Karen has made it for him a couple of time and although she says she followed the directions, I think she made enough to feed most of Ireland. His day right now consists of getting up around 0530, getting dressed, eating, morning meds, and preparing for his van which comes to pick him up around 0700. We've started to get into a pretty good routine, and barring any unusual happenings, he is ready to roll in an hour. He really liked his driver the first morning (Mr. Washington) who's nephew just happened to be Fontell Mines who was a UVA grad and now plays for the Redskins. He didn't like his afternoon driver too well though so I've tried to get him off the list. In the evenings after dinner, we watch Wheel of Fortune and Jeopardy (*In case you didn't make the connection to the title of the post). Amazingly dad is still able to beat me (well that's not so amazing) but he's also beating many of the contestants to the correct answers, which to me is pretty awesome. After that a little ice cream or something and off to bed. He is sleeping pretty well, most mornings he is awake when I go into his room, but today he was still snoozing. He seems to be getting a little more comfortable with things. The biggest problem so far is that he wont let anyone else do much for him but me so that's causing a few glitches, but were working through them. I know Mark posted my address the other day but my home phone is (804) 746-1178. If anyone would like to call him please feel free. The best times are probably between 6:00 and 8:00 p.m. or on the weekends. If anyone is in the area and wants to visit on a weekend I know Dad would love it. Just let me know your coming so we can straighten up (as required by my wife) and also if your from out of the area there's a Holiday Inn close by that works with me when there are rooms available. Thank everyone who has written, called, or come to see Dad. The letters and visits have meant a lot to him. When he is in a positive mood it definitely helps motivate him with his therapy. I know he intends to thank everyone personally at a later date, but until then I would like to thank you all. I'll continue posting his progress every few days or if there is something new and exciting to tell. Dad has gone through a lot in the last two months and come a long way back in his recovery, but there are still hurdles to cross so please keep him in your thoughts and prayers as I know that means as much to him as anything. Yesterday was Dad's first day of intensive outpatient treatment. I came to Richmond to take Dad and spend the day with him since Matt had spent the day before completing all of the necessary "stuff" associated with discharge from inpatient rehabilitation. Dad's new "school" is an outpatient extension of Sheltering Arms, in another part of Richmond, Bon Air, a little over 20 miles from Matt's house. A family member is required to go with every new patient on their first day and spend the day with them. I arrived at Matt's house a little before 7 a.m. and Matt had things well in hand. He was helping Dad get dressed upstairs, Dad's lunch was packed and in the refrigerator, and his medicine was out and ready. Dad came downstairs with little trouble, made it to the breakfast table and began telling Matt what medication Matt needed to get for him. While he ate breakfast I gathered up the belongings Dad would need for the day. When it was almost time to leave we realized the pharmacy had not filled the one prescription Dad had to have at lunchtime. Matt quickly called the pharmacy and got the situation straightened out but had to run out to pick up the prescription. This left me getting Dad into the car. I spent most of Monday afternoon in the family training, where the inpatient staff taught Matt and I how to help Dad up and down stairs, in and out of the car, help him with dressing, transferring, and getting in and out of the tub. It was all fine and dandy when you had therapists, aides, and nurses standing by but now I had to do it myself. I don't know who was more nervous, Dad or me. We did great getting to the back door, o.k. down the steps to the wheelchair, and I rolled him out to the car. Then it got more difficult. They had taught Dad to get into the car from his walker but Dad was in his wheelchair. I tried to talk him into going from the wheelchair to the walker and then to the car but he would have none of it. He was determined to go straight from the wheelchair to the car--something he had never done before. I looked out for Matt--no Matt yet-- stalled a few minutes--still no Matt. Dad was starting to get a little impatient so I took a deep breath, said a quick prayer and told Dad, "O.k." It wasn't the most graceful transfer but we accomplished it. Matt arrived with the medicine and we were off--as Dad would say-- like a herd of turtles. The day went well. Dad met with each therapist to have a new assessment completed on his current level of functioning. It made me realize how far he has come when I saw three patients still on tube feedings. Dad's walking was wonderful and he even did a few new things such as walking up a ramp, going down a curb with only his walker and walking down steps backwards. He continues to be impulsive in the way he does things often starting out before given directions. Probably the biggest challenge still to come has to do with Dad's apraxia (Apraxia is where a person loses the ability to execute or carry out skilled movements and gestures, despite having the desire and the physical ability to perform them). Dad would try as hard as possible to complete fine movements, such as picking up small objects, with his left hand but you could see him struggle as his face would wrinkle with concentration. The good news is that Dad is able to pick these things up it just takes about three to four times as long as with his right hand. More good news Dad's hand grip is equally as strong in both his right and left hand. The strength of his finger grip is much less in his left hand which would go along with his symptoms. Another part of apraxia is difficulty or inability to coordinate activities with multiple, sequential movements, such as dressing, and bathing. Again the good news is that Dad can do this but it is a slow struggle. Finally, they did a very interesting test much like you would see on psychological testing. They would show Dad a symbol at the top of a page and he had to match that symbol with one of four at the bottom of the page. Dad did this well. He started to have difficulty though when they took out parts of the symbol. For example an arc in a circle was missing. Dad had to point to how the symbol would look if all the lines were filled in. Dad missed about 50% of these. What I didn't realize is that our brains "fill in the pieces" when we see only "part" of an object. For example, we can visualize our coat in the closet by just seeing the sleeve sticking out. Even more importantly, we see a child's head over the hood of a car and realize a "whole child" is behind the parked car possible getting ready to run out into the street. The implications of this in our daily lives was staggering to me. Well, enough of the details. Just as in Mechanicsville, the staff at Bon Air were wonderful. They were very patient with Dad who had a new audience to tell all of his stories to. The nurse, who is a die hard Hokie, didn't even hold it against Dad for being a Wahoo. After getting a full history she explained to Dad that one of the main goals of intensive day treatment is to rebuild his energy and to work as hard as possible, even during down time, to regain his lost skills. To that extent they are only allowed two 15 to 20 minute breaks a day and their lunchtime. During the other times when they are not in therapy they will practice the skills they've learned. This is done through games and activities in the day room. They even have a Wii to play. I think we will probably have to teach Dad a little about it first so he doesn't throw the controller through the T.V. Dad and I left about 3 p.m. tired but a lot less nervous. It was nice driving back to Matt's house, talking about the day, the weather, and those small things that make up our lives. These are the moments that remind me of the miracle we have seen over the past several months. My father is truly a miracle, surviving against all odds and now not only surviving but making progress beyond what any of the professionals ever believed. As for me, he's my Daddy and I still believe, just like I did as a child, Daddy can do anything. 4/16/09 -- Out of the Hospital! Although Dad no longer requires in-patient care, he still has some medical issues to contend with. So he will be seeing various doctors over the next few weeks, in addition to having several hours of strenuous rehab each day. My guess is that he is going to be very tired at the end of most days, but also very happy to have taken one more step on the road to recovery. Finally, I know I speak for the whole family as well as all of Dad's friends when I say how fortunate we are that Matt and Karen are on the scene, and how much we appreciate their willingness to take on the substantial responsibilities of helping care for Dad while he is attending the day program. As long as I have known him, my father has been a man of faith. Like many men of his generation, he came to the Church during war. I have never heard him waiver in his devotion or question his faith. I have, frankly, always admired this in him, particularly given the struggles I've had throughout my own life figuring out exactly what I do and do not believe. One thing I do know is that Dad's faith has been a comfort to him throughout this ordeal, particularly in those moments early on when things seemed pretty bleak. Today is Easter Sunday, a day of hope, and on this day it seems especially appropriate to note and appreciate this special aspect of our father's character. I've just spent the last three days with my father. I had this week off for spring break and decided to go to Richmond, and just spend time with Dad. I'm very tired but had a wonderful couple of days. Mom and I arrived on Tuesday around lunch time, and Dad was in the dining room. When he saw me come through the door, the biggest grin broke out on his face! I get misty-eyed just thinking about it. I didn't think his smile could get any bigger until I told him Mom was waiting in his room. (I don't know if he was quite as happy with me after I participated in his therapies for the next couple of days; he called me his "drill sergeant" and "slave driver," but he said it with a smile). Dad is now eating pretty much anything he wants. For lunch the first day I was there, Dad had chicken and lasagna as well as vegetables and fruit. He even had a pork chop for dinner one evening. According to Dad, his speech therapist will sneak up on him when he least expects it to make sure he is cutting his food in small-enough pieces, is chewing thoroughly, and swallows twice. He says the food is great, and I'm sure just to be eating has got to be wonderful. Dad is now totally off insulin. His blood sugar levels have been good. According to the speech therapist, Dad's short-term memory -- which was initially affected by the stroke -- is back to about 90%. I can't tell any difference in his cognitive processing skills from before the stroke. For instance, one day he was talking with one of the therapists about how the stock market is set up so that it will self-correct, but not if there are crooks taking everyone's money! (For those of you that don't know, Dad was an economics major.) His attention and concentration are still not where we would like them to be, but they are so much better it is incredible. Actually, Dad is "hyper-concentrating" at times, which can be a problem. When he is told to do something, he sometimes concentrates so hard he doesn't hear any further directions until the first task is done. For example, when they tell him to walk up a set of stairs he focuses so hard on what he is doing he misses further instructions on how to do it more safely and effectively. Sometimes it is good to see for yourself how someone is doing. When I've talked to Matt or Mark in the past couple of weeks they would tell me that he walked 120 steps, or 150 steps. I had thought this was as far as he was capable of walking. What I found out this week was Dad could walk a whole lot more, but there is only so much time to get everything accomplished. So, they normally have Dad walk once around the small physical therapy gym. This gives him exercise and warms him up for his other tasks. The therapists are concerned that Dad shuffles when he walks but, as Mom says, he practically wore the carpet out shuffling before the stroke so I don't know how much that will change. Dad does great getting from a seated position to standing with his walker. There are more steps in the process of going from his walker to a seated position, however; and while he can do this, he doesn't always do it as well as we would want. Dad has the most difficulty going from his bed to a wheelchair, as this requires a great deal of upper-body strength and a number of fairly complex moves with each hand. In occupational therapy, Dad is working very hard on dressing himself. Watching Dad do this makes me realize how much we take for granted. Just to put on a shirt has so many steps, and takes more time and effort than you would think. I cannot say enough about how wonderful the staff is at Sheltering Arms. They put up with my many, many, many questions and my watching over their shoulders to see everything they did. Every therapist, aide, and nurse appeared to be as happy as Dad was when he made progress. They all seem to care about him as a person, not just doing their job. Finally, the staff is beginning to talk about discharging him, with a tentative date set for next Wednesday. Because of the amount of progress Dad has made, they are recommending he attend their day treatment outpatient program, where he will continue to receive intense therapy and, hopefully, continue to make progress. This program is at another Sheltering Arms facility about twenty miles away. Because it is a short-term program, Dad and Mom will be staying with Matt for the next few weeks, with the rest of us coming in to help out on the weekends. Dad's room looks like a Hallmark store. Thank you all for the continued cards, letters and prayers. Dad talked several times about wanting to write everyone and thank them for everything they have done. He knows he is not yet capable of doing this much writing so we made a deal that I will help the next time I come to see him. We may only get to one or two a visit but please know Dad is thinking of all of you and you are in his prayers. Today I saw Dad for the first time in ten days. There is a lot to report, so this post will probably be longer and maybe a bit more clinical that usual. The good news is that most of the news is good. The progress that has occurred in most aspects of Dad's rehab during the last week and a half is remarkable. This is nowhere more evident than in his voice. In my post dated March 25th, I wrote that "the cadence of his speech and the timbre of his voice still betray the effects of the stroke . . ." That is no longer the case. About 95% of the time, there is no real suggestion of the stroke in his voice. It is clear and strong, and sounds strikingly normal. Dad's mind, likewise, is sharp. His memory seems almost entirely intact, and he is very aware of current events. His attention span and focus, while not perfect, have definitely improved. During my visit, Dad and I watched the first game of the NCAA Final Four, in which Michigan State defeated UConn. We kept up a running conversation on all sorts of subjects (for example, I learned the origin of the nickname "Chuck") while at the same time Dad remained aware of what was going on with the game. All in all, pretty impressive. Dad's attitude is also pretty good. He seemed upbeat and energetic, which frankly I find amazing given what he has endured this past two months. (Is it really possible that it's only been two months?) His sense of humor is intact and, happily, the easy smile we all remember has returned. On the physical side, things are more of a mixed bag. On the plus side, the dexterity in Dad's left arm and hand, which were very affected by the stroke, is much improved. This was particularly apparent when he took his medication. He used his left hand to pick up each pill and put it in his mouth, while at the same time holding a cup of water in his right hand. This is solid progress. On the other hand, significant challenges remain. Dad's strength is starting to return, but progress in that regard has been excruciatingly slow. While he is working hard in rehab, he remains weak and is dependent on the staff for most everyday tasks. His left arm and hand, while much improved, are still a long way from what they were before the stroke. We all remain optimistic that there will be continued physical improvement, but it is impossible to know how fast and how far. Where Dad goes from here very much depends on the answers to those questions. Dad had sausage and eggs for breakfast today. It is hard to overstate the significance of this seemingly little thing; it is a true milestone in his recovery. He is now receiving about half of his nourishment the good old fashioned way -- he's eating it. This is exceptionally good news, and we are all thrilled. While I have not gotten a detailed report on the results of the meeting of Dad's therapy team, I understand that in general his rehab is progressing well on pretty much all fronts. While Dad still has a good way to go, we will hopefully continue to see this kind of progress. So, everyone, as Matt and Anne encouraged in their posts last night, knock wood, keep your fingers crossed, rub the rabbits foot and if you happen to find the random four-leaf clover, well, you may want to enclose it in your next "get well" card. The Post You've All Been Waiting For. Matt's First!!! Just kidding about the title, but this is my first posting for a very good reason. I didn't want to jinx dad. I know that sounds superstitious... and it is. And yes I'm knocking on wood now as I type this. However, I witnessed two events today that made me feel it was worth breaking a couple mirrors to share with everyone who has been following this blog. As everyone is aware, mom has been a bit under the weather for the past several days and has not seen dad since last Wednesday. While that may not seem like much to you and me, to mom and dad it must be like an eternity. I can't recall in my lifetime the two of them ever being separated for more than a few hours; maybe a day if dad were gone on one of his school conference trips to Wintergreen Resort. Since retirement, the most time they've been apart would be when mom would skip church or dad would go to Hot Springs to work out. I've always been envious that two people could spend that much time together and yet still seem to miss one another when they were apart for just a short while. Anyway, back to today's events. I left work today about 5:00 and went to see dad before going to pick mom up. When I walked into dad's room I was met with a big grin; a "hello son"; and a "guess what I get to do tomorrow? I get to eat my first real !" That's the most excited I've seen my father since all of this began. He then proceeded to tell me that his speech therapist says he is doing great and she is fixing him some type of hamburger dish tomorrow. He then started telling about three stories that she read to him and he had to answer questions pertaining to each story. He said he got every question correct. Dad said the speech therapist thinks his mental awareness has definitely improved over the past few days... namely since his blood transfusion. Lets all keep praying for his improvement. I told dad I had to leave but if mom was up to it I would bring her back to see him. I didn't think I could see dad anymore excited then I did when he told me about getting to eat tomorrow. Well I was wrong. When dad saw mom walk through that door after not seeing her for the better part of a week, he looked like I always imagined the coyote would have if he had ever caught the road runner... grinning from ear to ear and trying to hold back tears all at the same time. I just told mom I'd be back in a while and shut the door, leaving the two of them to their reunion. As my kids would say, "that was one of the coolest things I've ever seen." I'll let everyone know how the meal goes tomorrow. We should also be receiving dad's team report around the same time. Lets all keep our fingers crossed till then. Good Luck Dad!!! Do you ever have the feeling if you say something positive you will jinx it? Well, this is where I am right now. My father is a wonderful Christian man, but this does not stop him from being one of the most superstitious people I know. If you have ever seen my father spill salt and have to throw it over his shoulder or walk across the street to avoid a black cat you would understand. This is how I feel now. I feel as if I should be knocking on wood and rubbing a rabbit's foot along with my prayers. My father has actually had several good days in a row--especially today. He was read three stories and remembered all of the details (way to go with the attention span), physical therapy is going well and he gets to eat a small meal tomorrow. Dad is proud of himself as we all are. I am just a little afraid to say anything, I might jinx it and he will start going down the roller coaster again. I know in my heart God understands and probably gets a laugh at me going through my den knocking on all my wood paneled walls. I'm spending the weekend at home in Massachusetts celebrating my wife's birthday, so this post is courtesy primarily of daily e-mail updates from my brother Matt. Matt has been truly doing yeoman work these last couple weeks; despite being very busy at work and at home, he has been shuttling back and forth to Sheltering Arms to visit Dad multiple times a day. He and his family are also hosting Mom when she is in Richmond. We are extremely fortunate to have him on the scene. It has been a fairly quiet weekend for Dad, which I think we all agree is a good thing. Matt reports that Dad seems to have more energy since the transfusion. Because it's a weekend, Dad's rehab schedule has been light and there haven't been any new reports on how his rehab is progressing. We should hear more on Tuesday. Dad got to eat "real food" yesterday. He got to eat cantaloupe and pineapple and from what I've heard was in heaven!!!!!! He has been able to attend therapies every day since he has his blood transfusion. He still doesn't have a great deal of energy but compared to the fact he wasn't able to do therapy at all before the transfusions this is a hugh improvement. Mom continues to recover from the flu. From what Matt tells us half of Richmond seems to have come down with this stuff. We are very lucky that Dad has not gotten it. Terry did not have a chance last weekend to see Dad so she is making the trip to Richmond today. It is still rainy and yucky so I hope she is VERYYYYY careful going over Afton Mountain. Hannah is extremely upset at her mother (me) for not taking her to Richmond this weekend. Since Mom isn't feeling up to company I didn't want to have too many people descending on Dad and, while I know it sounds selfish, I've used all my sick leave and I don't want to take the chance of getting anyone in the family sick and having to be off work. I have one more week of work and then I'm off until after Easter so I keep telling myself that it's o.k. to take one weekend to get some very sorely needed chores done. I want to thank everyone who has called and checked on Dad and who are following the blog. I have a list of people who I feel I need to call personally and I apologize to everyone who I've not called this week. It has been a busy week at work and I find I am not working at my usual speed and efficiency because part of my brain is always on the folks. Some days I come home so tired and when the choice is a nap or the phone I have been choosing the nap. Sorry everyone.... I'll try to do better this week. The blog this morning is rambling.... again sorry everyone. As you can probably tell, my part of the blog reflects my mood and current emotions, which are normally pretty close to the surface. This morning my mood is just like the blog, rambling...... I hope everyone has a wonderful weekend and I will write more once I get a report from Terry today. God bless you all!!!!!!! First, my brother's blog from yesterday is one of the most beautiful things I have ever read. It spoke to how we are all feeling. I am teaching Hannah to play bridge and she has already said she will help Grandpa play when he gets home. I am so blessed to have such a wonderful child. They gave Dad two units of packed blood cells last night. His red blood cell count was below normal, his white cell count was slightly up, his hemoglobin was wayyyyy down, as was his albumin. Mom indicates Dad was anemic before he had his stroke but after everything he has been through it appears the anemia is much worse. They are running tests just to make sure he does not have an infection. Hopefully the blood will give him the energy he so desperately needs to get on with rehab. Everyone in the family has had the stomach flu and now Mom has it. Mom is tired too from everything that has happened over the past couple months. Mom has been such a trooper and I think we have been so focused on Dad we sometimes forget about Mom. Please have Mom in your prayers too. I will call this afternoon to check on Dad and will post an update on the blog as soon as I hear.